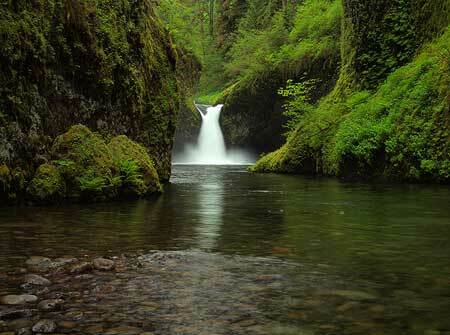 The Eagle Creek canyon is the undisputed jewel of the Columbia River Gorge, thanks to a string of dramatic waterfalls and a precarious, cliff-hugging trail built over 100 years ago by visionary Forest Service pioneers. 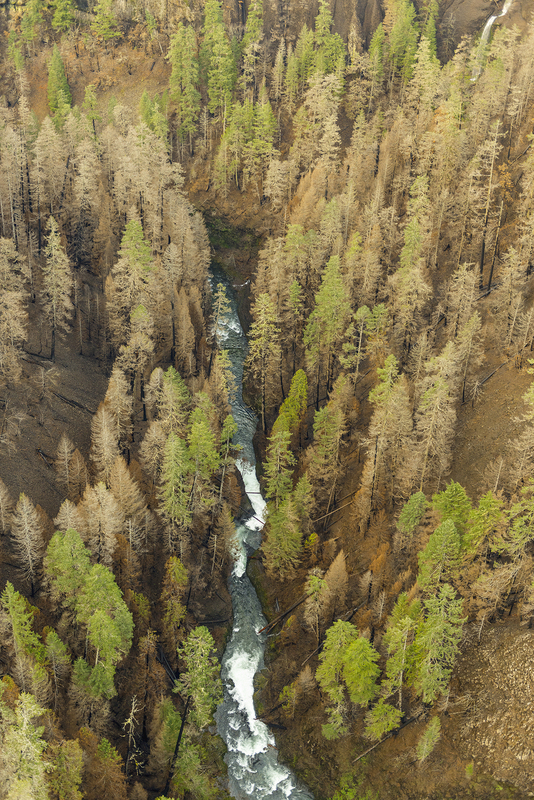 But starting in late 2016, a series of calamities over the course of just a year reshaped Eagle Creek for the foreseeable future. 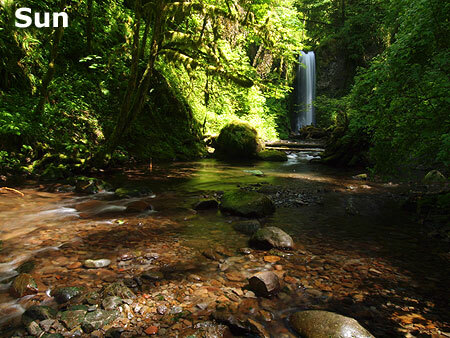 The first of these events came in late December 2016, when a huge section of cliff at Metlako Falls calved off, damming Eagle Creek with a massive pile of debris and erasing the iconic viewpoint of the falls (where the above photo was taken in 2013) forever. 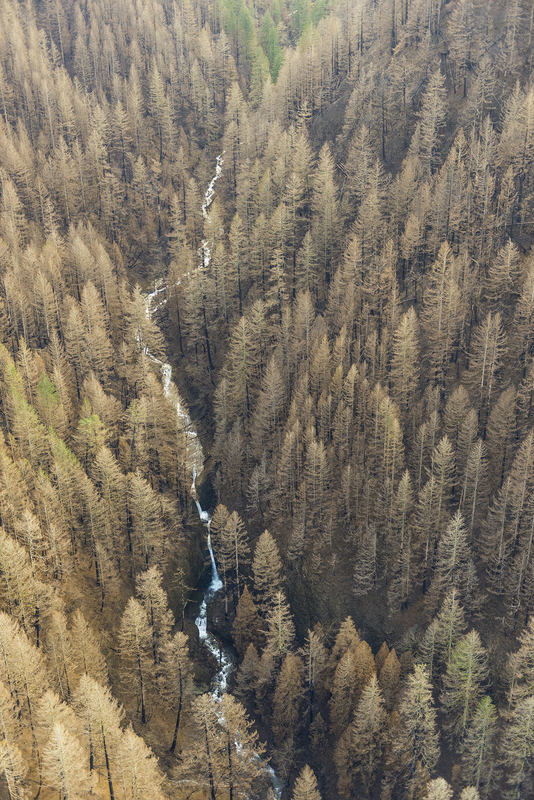 Round two was the sprawling Eagle Creek Fire the followed in September 2017, burning all but a few strips of streamside forest in the Eagle Creek draining. 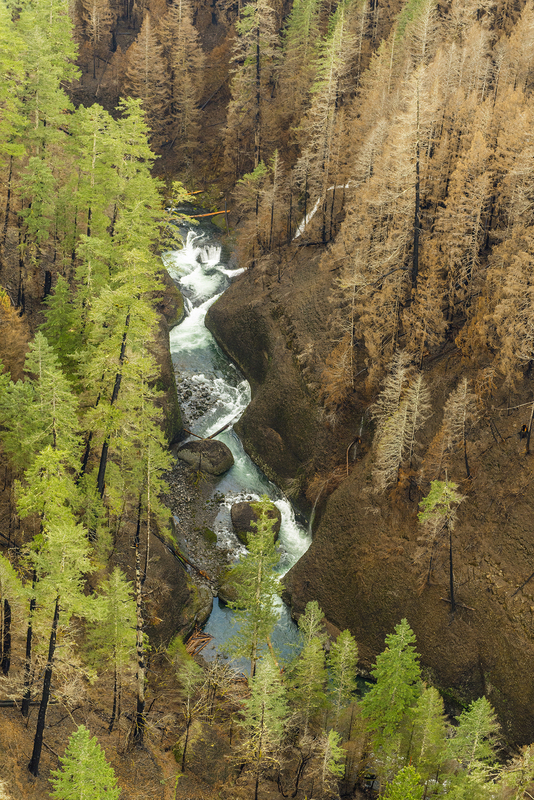 Then, sometime in early 2018, another massive cliff collapse occurred at Punchbowl Falls, rerouting the entire creek and forever changing still another iconic view. 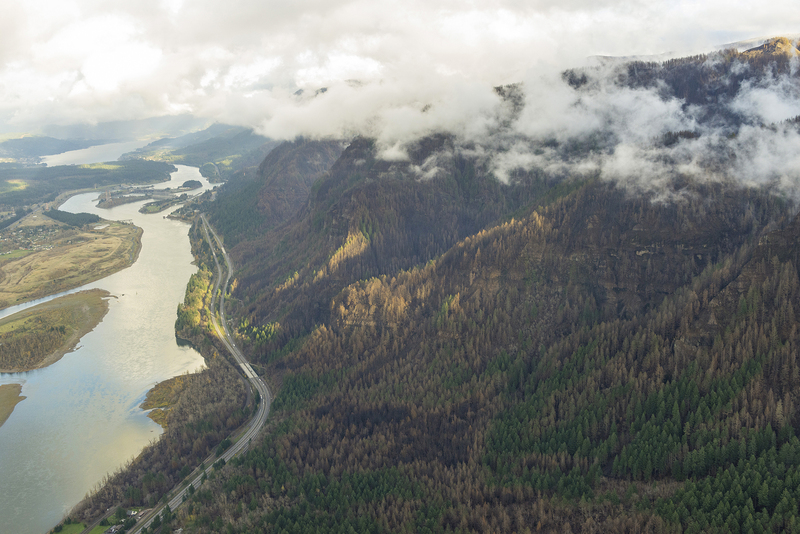 Changes on this scale are nothing new in the Gorge. 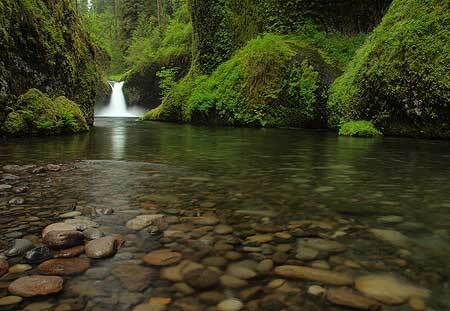 In fact, they are the very processes that created the scenery we enjoy today. 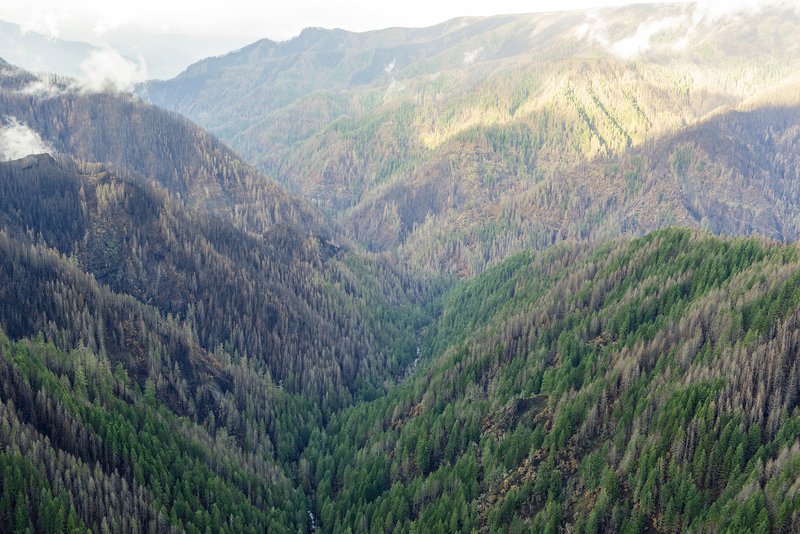 Without fire, we wouldn’t have cliff top meadows, gnarled Oregon white oak groves and huckleberry fields on the highest ridges that rim the Gorge. 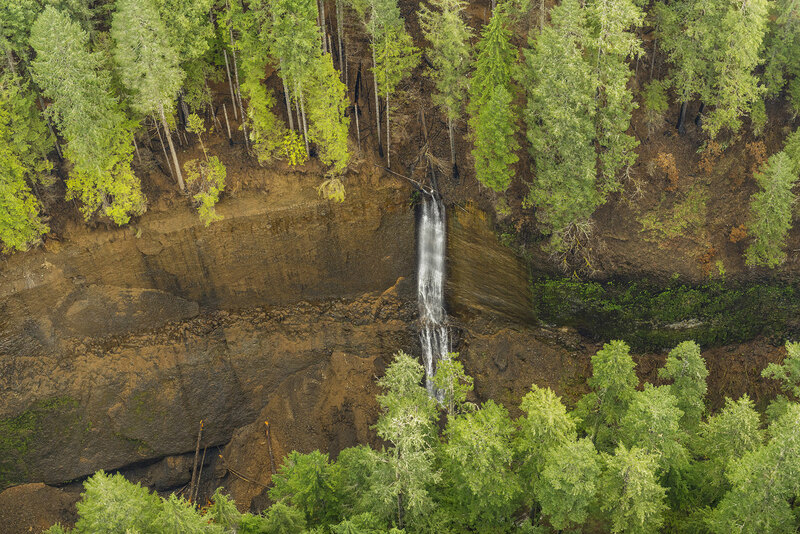 Without landslides and cliff collapses, we wouldn’t have vertical basalt canyons and the towering waterfalls within them. 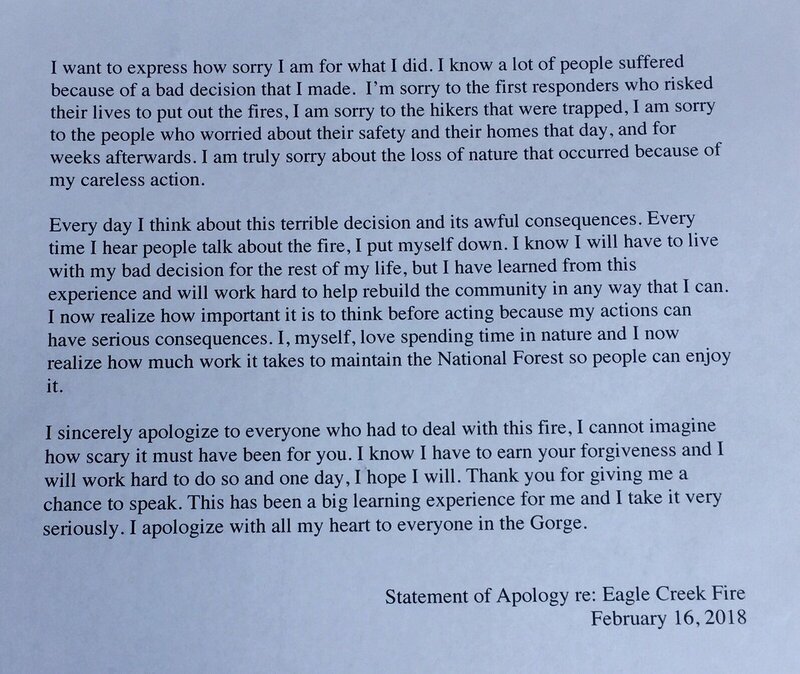 In this way, the changes at Eagle Creek have given us a rare look at the natural forces behind the beauty, and a chance to better understand and appreciate the ongoing evolution of this very unique place. 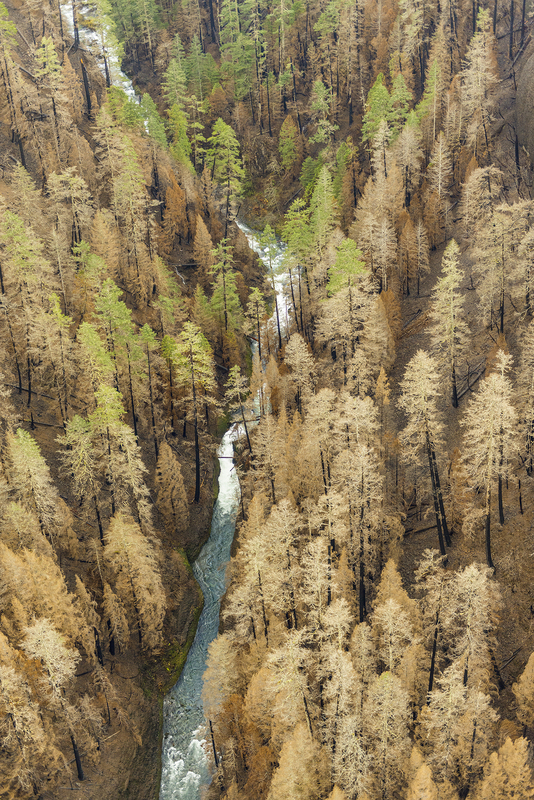 Since the 2017 fire, volunteer trail crews have been working with the Forest Service to restore the Eagle Creek Trail. 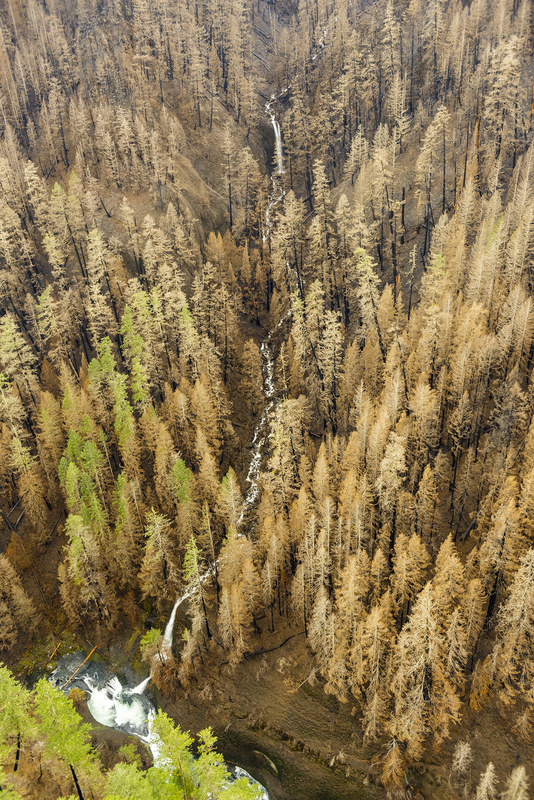 The fire heavily impacted the trail (see Eagle Creek: One Year After the Fire), and volunteers have invested thousands of hours clearing logs and debris and rebuilding much of the trail tread. 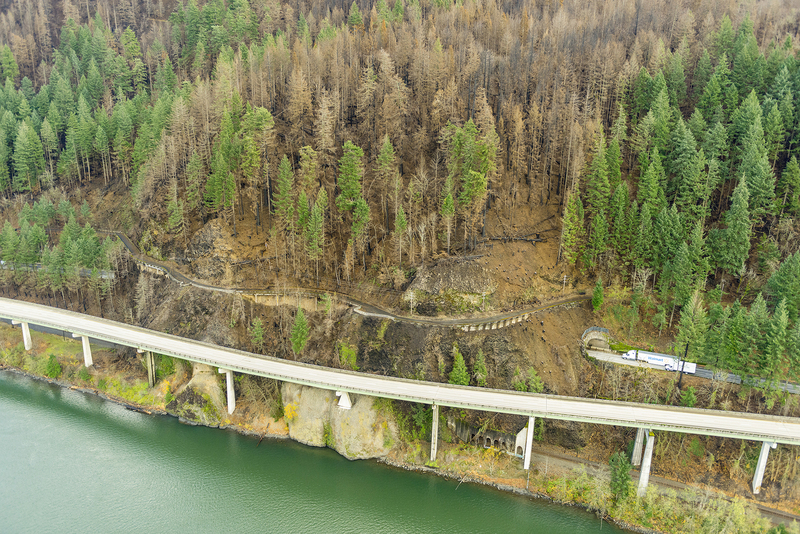 For its part, the Forest Service is working to replace several large footbridges that were destroyed by the fire. 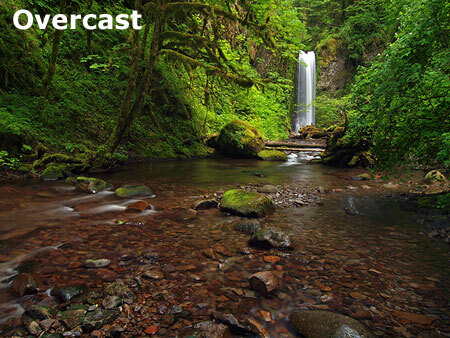 With the reopening of the trail imminent (perhaps as early as this year) there remain plenty of questions about how Eagle Creek will be better managed in the future to prevent a recovering ecosystem from being impacted by swarms of visitors. 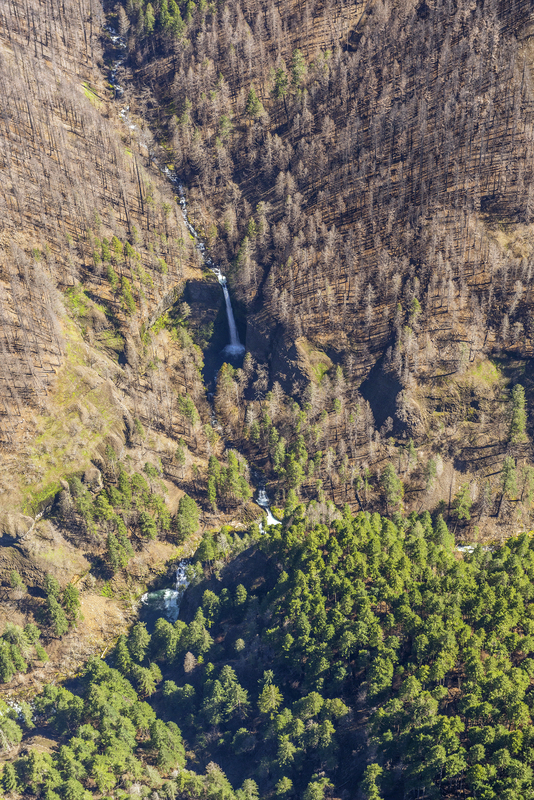 This article focuses on anticipating and managing these impacts at Metlako Falls, where hikers will almost certainly create a cobweb of user trails in search of an alternative to the collapsed viewpoint, especially now that the dense understory that once hid the falls from the trail has burned away in the fire. 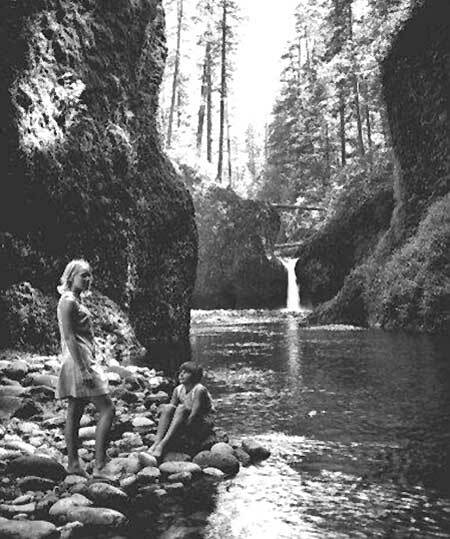 The joy of the old Metlako Falls overlook was in the discovery. A pair of modest spur trails dropped through forest to a sudden and spectacular overlook, where a pair of braided cable railings stood between you and the sheer, 200-foot drop into Eagle Creek. 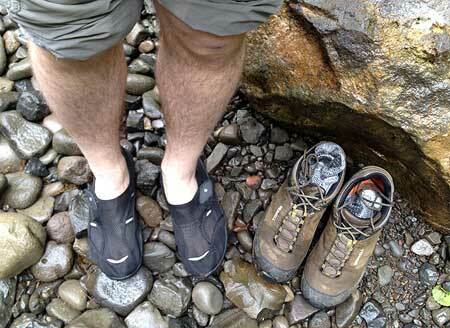 As iconic as the view up the narrow gorge to Metlako Falls was, it was also tedious to maintain. The cliff top just below the railings was dense with understory, which regularly grew to obscure the view of the falls. Trimming the brush required professional crews equipped to descend the cliff with ropes or volunteers willing to pack a pole pruning saw up the trail. It was an ongoing battle, with the understory winning — and hikers inevitably crawling over the railing for a better look. It’s a miracle that nobody (that I know of) slipped over the side at the old overlook! 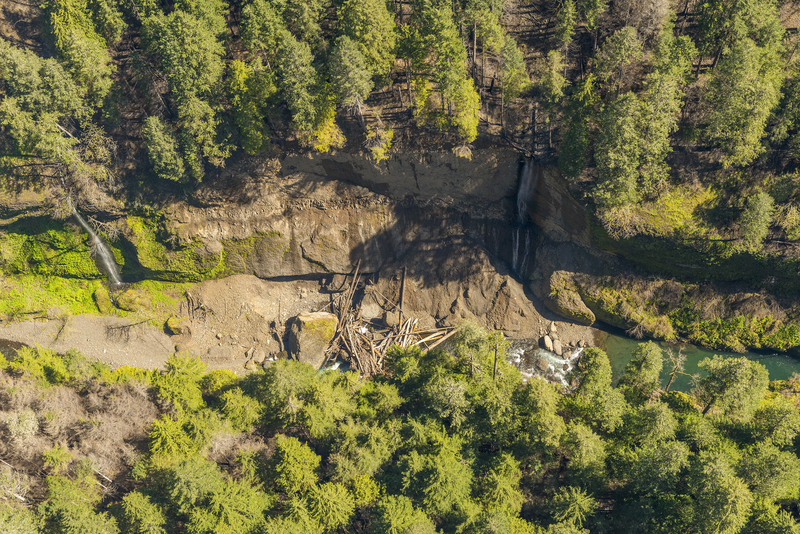 In this way, the cliff collapse in 2016 and fire in 2017 offer an opportunity to create a new viewpoint at Metlako Falls that is both easier to maintain and provides less incentive for hikers to explore beyond the trail. 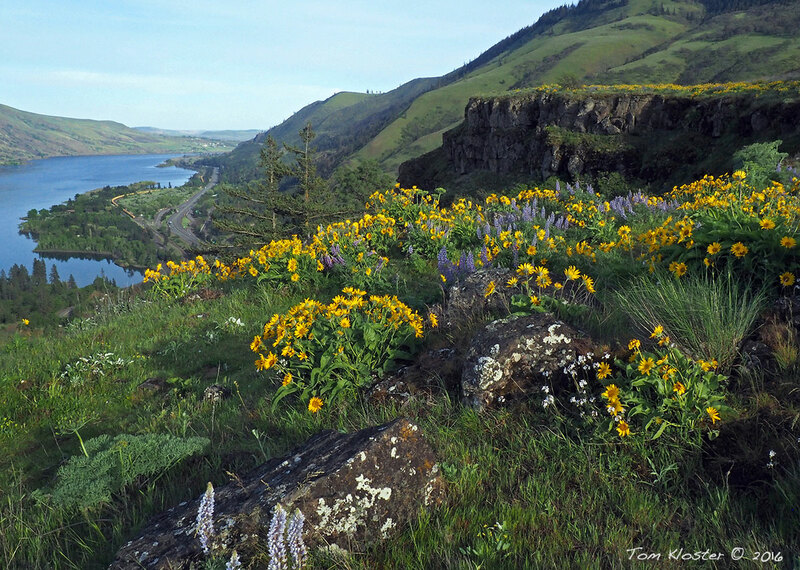 I believe such a spot exists and that a spur trail to this new viewpoint could easily be developed by the volunteer crews already working to restore the Eagle Creek Trail. I also believe that without creating a new viewpoint, the crush of hikers who use this trail will seek one out, creating a hazard for hikers and harming the recovering landscape in the process. 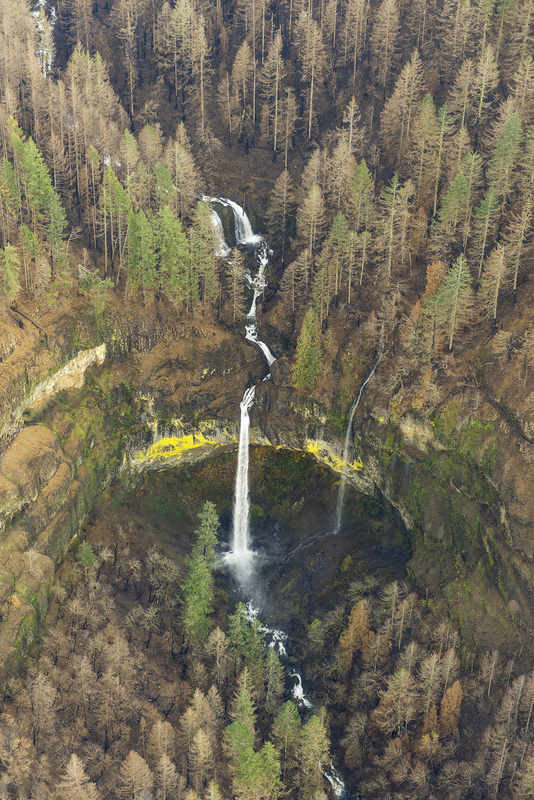 Here’s a not-so-secret scoop: for the past decade or so, daredevil kayakers have been sailing over Metlako Falls as part of the “extreme kayaking” phenomenon of waterfall jumping. 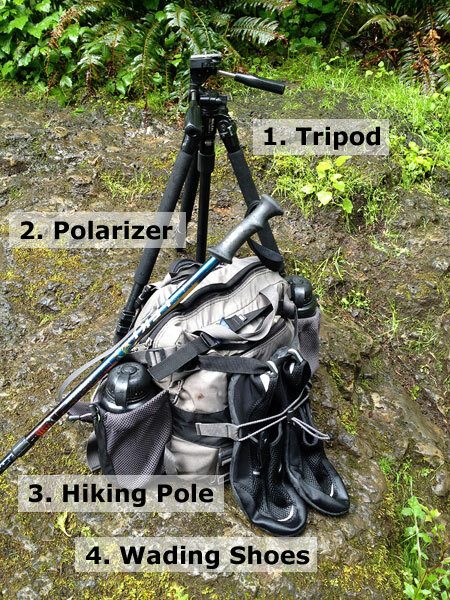 These stunts at Metlako Falls have been regularly recorded for social media (of course!) 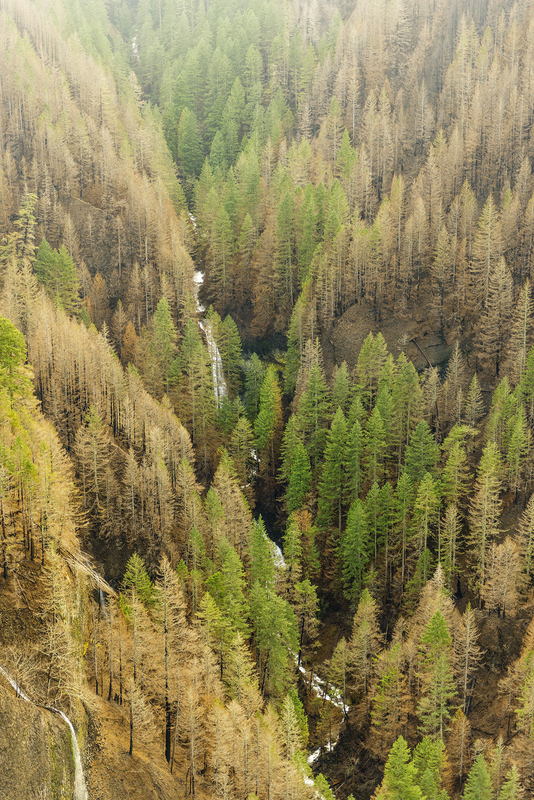 and thus a well-worn user path already descended to a viewpoint directly opposite the falls well before the Eagle Creek Fire swept through the area. The post-fire absence of forest understory will make this user trail all the more obvious, and thus my confidence that it will become a heavily used boot path when the main trail reopens if a planned alternative isn’t provided. 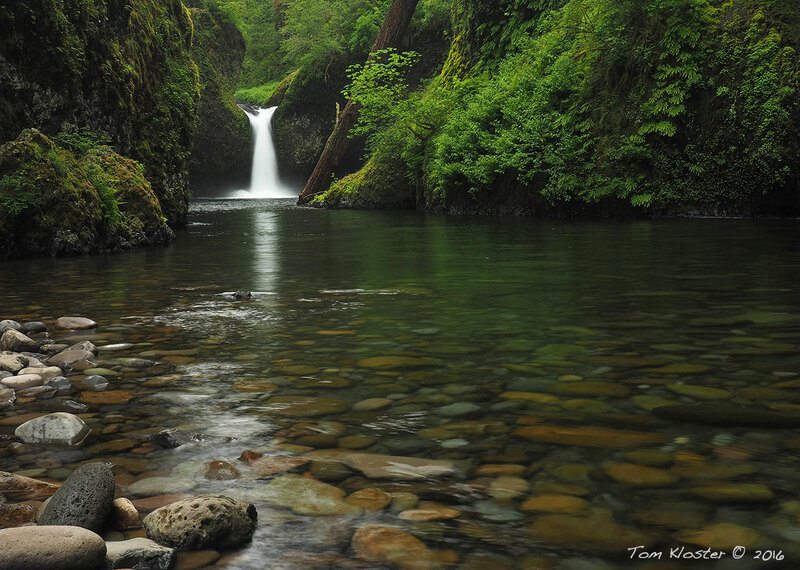 The time to act is now, before hordes of hikers are allowed back into Eagle Creek. So, where is this not-so-secret user path? 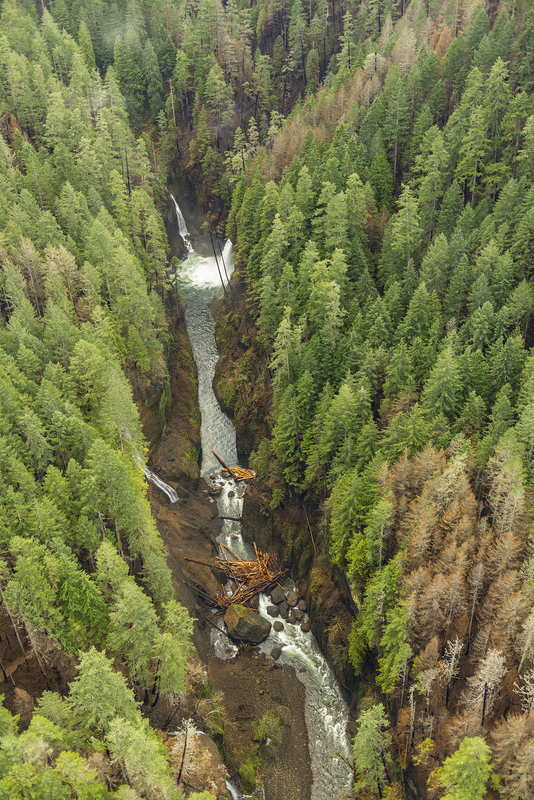 The following views from one of the State of Oregon helicopter surveys of the Eagle Creek Burn were taken in 2018, and show the unofficial Metlako Falls viewpoint nicely. This closer view (below) shows more detail of the proposed new viewpoint. Notably, it’s located atop a sheer basalt cliff that would provide a clear view, but could also discourage hikers from venturing beyond the viewpoint. Also notable are the many surviving conifers on the bench that forms the viewpoint that will help stabilize this area in coming years as the understory recovers from the fire. 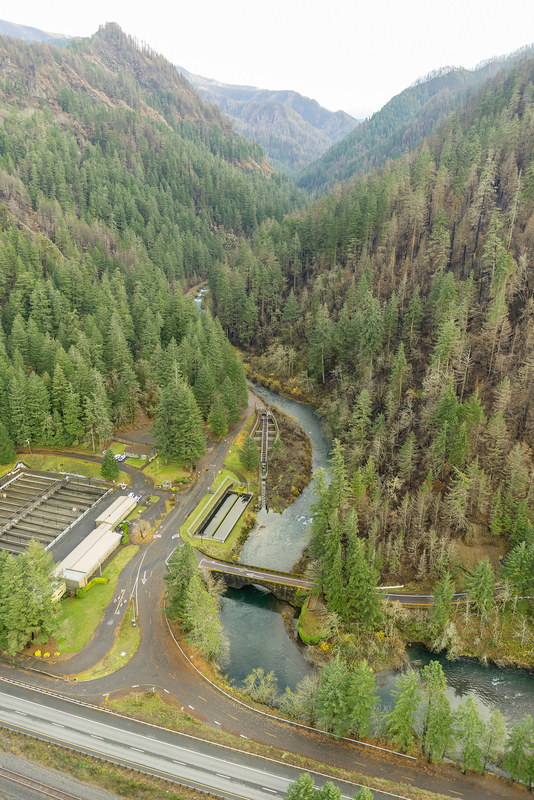 This wide view (below) is the reverse of the opening State of Oregon aerial, looking upstream toward Metlako Falls. 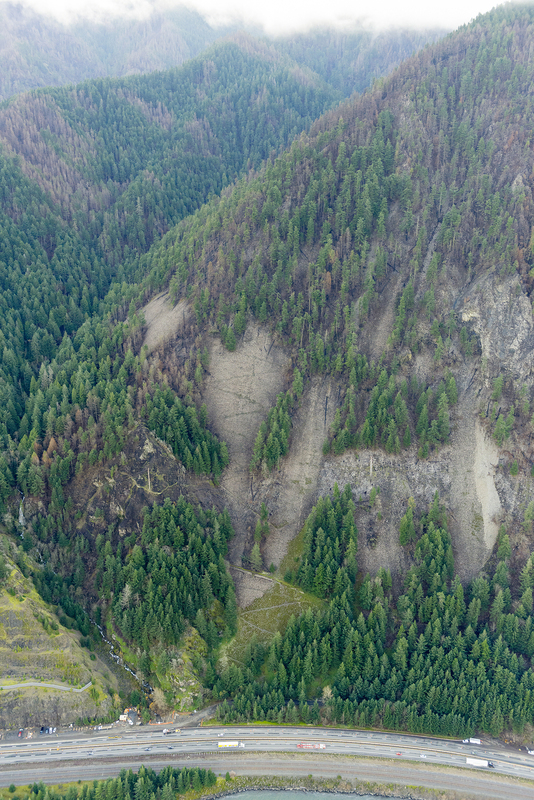 This view shows the debris from the 2016 cliff collapse and the dammed section Eagle Creek above the debris pile. 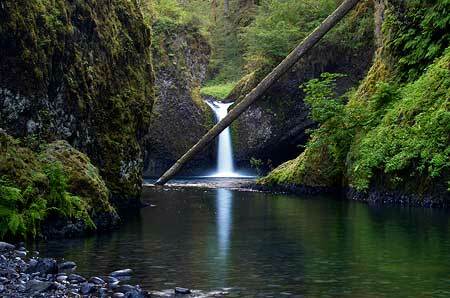 But there’s also a surprise next to Metlako Falls in this view. 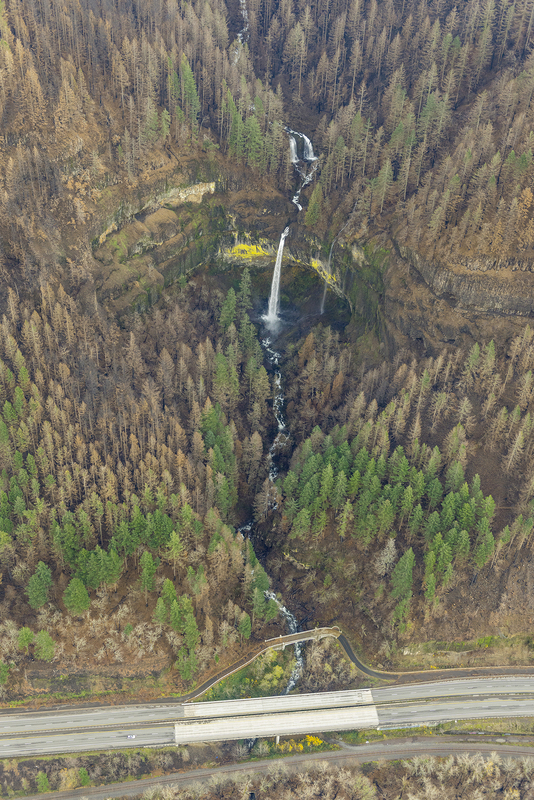 The slender cascade dropping into the opposite side of the Metlako amphitheater is Sorenson Falls, a seldom-seen beauty not visible from the old viewpoint. Could the new viewpoint be designed to allow this beautiful falls to be seen, as well? I think so — and in that way, the new viewpoint might be even more spectacular than the old one! 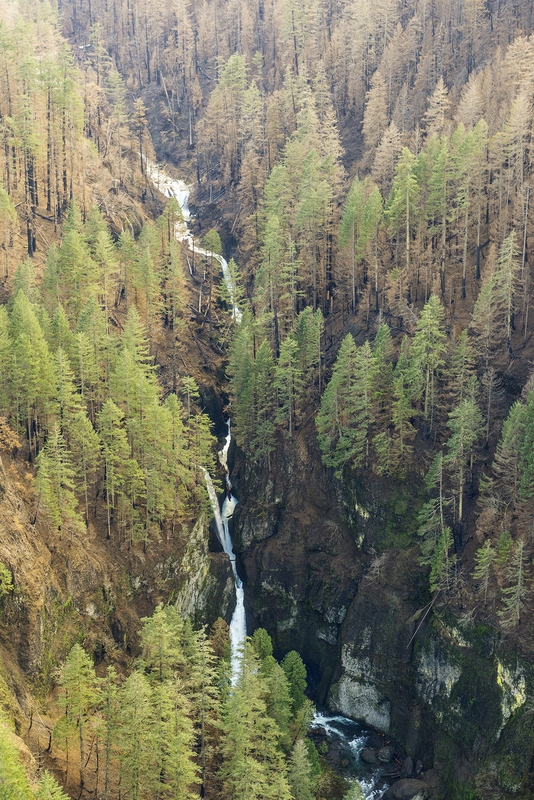 While the Forest Service has been reluctant to even consider new trails in the Gorge in recent years, the Eagle Creek Fire may have created a window of opportunity for rethinking the status quo. 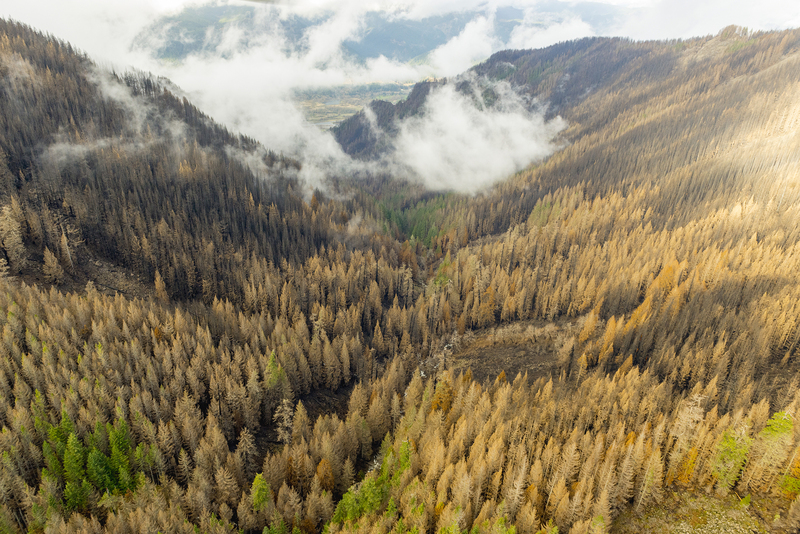 However, the need for a formal environmental assessment is often a Forest Service obstacle to building new trails, even if the agency is open to the idea. But there’s a shorter path for the proposed Metlako Falls viewpoint. The National Environmental Protection Act (NEPA) calls out “categorical exclusions” for certain activities that exempts them from having to complete an environmental assessment. The proposed viewpoint easily meets this test. This is because one of the “exclusions” under NEPA are trails negatively impact by natural events (like a fire or cliff collapse) and the Act gives great latitude to the Forest Service when relocating or realigning trails in response to such events. 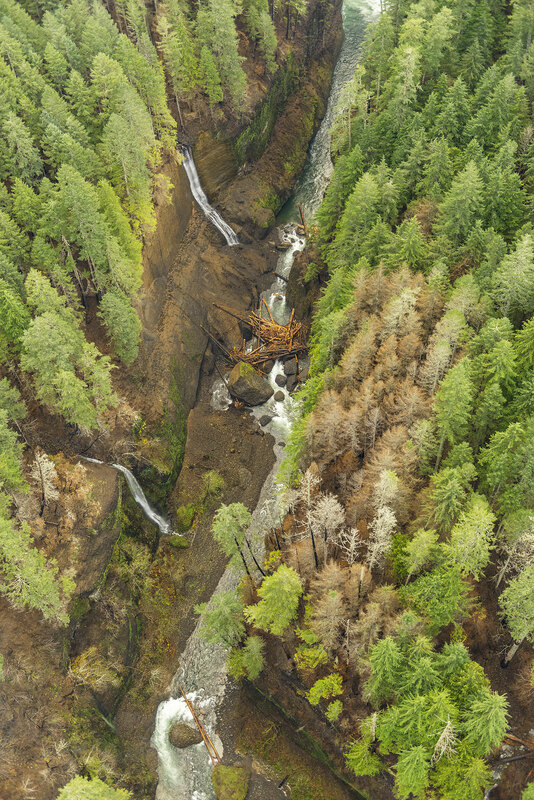 The Forest Service would still need to rely on agency scientists to complete a site evaluation of a proposed spur route for soil stability and other design considerations, but much of the expensive and effort required for a full environmental assessment can be avoided. The new spur trail would be very short — only about 100 yards in length and descending about 50 feet in elevation from the existing Eagle Creek Trail (see schematic, above). 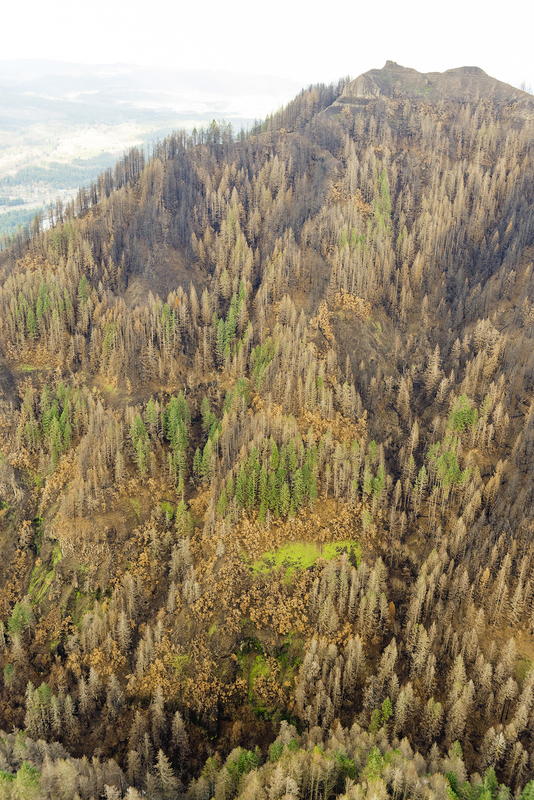 This not only helps make the case for a categorical exclusion, it also puts the proposed trail within reach for volunteers to both design and construct in cooperation with the Forest Service. 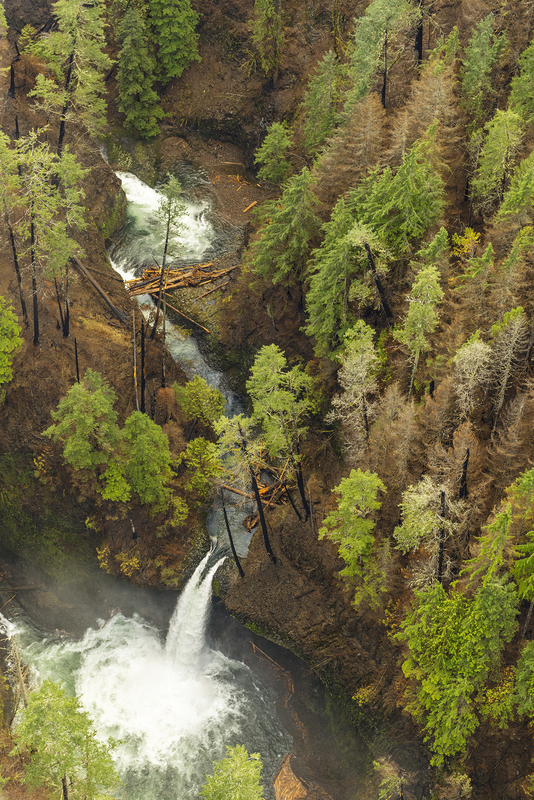 The viewpoint, itself, would likely require the Forest Service to design of some sort of cable railing, perhaps similar to the old viewpoint and the Punch Bowl Falls overlook, or possibly a deck similar to the structure at Panther Creek Falls. But even this detail is within reach for trail volunteers to constructing, with the Forest Service simply providing the design and materials. 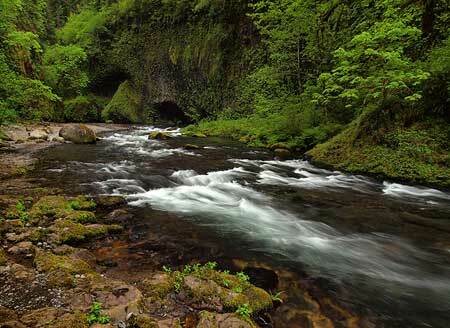 If some other alternative isn’t provided, hikers will almost certainly follow the kayaker’s user trail to the unofficial Metlako Falls viewpoint when the Eagle Creek Trail is reopened. With volunteer crews already working to reopen the trail, it makes sense to build this viewpoint spur now. 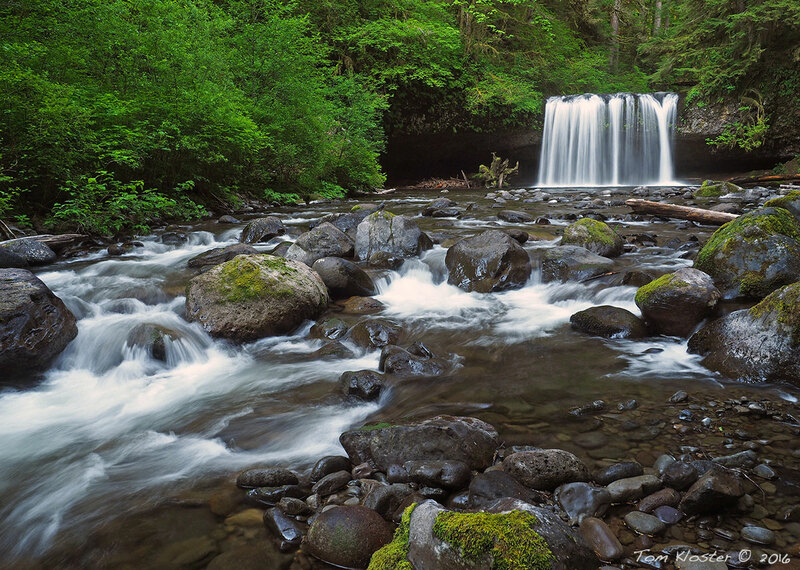 My hope is that we can be proactive and create a stable, sustainable way for hikers to view the falls before thousands of boots on poorly aligned user trails force the Forest Service to react. The calendar sales help cover some of the costs of keeping the campaign website and WyEast blog up and running. 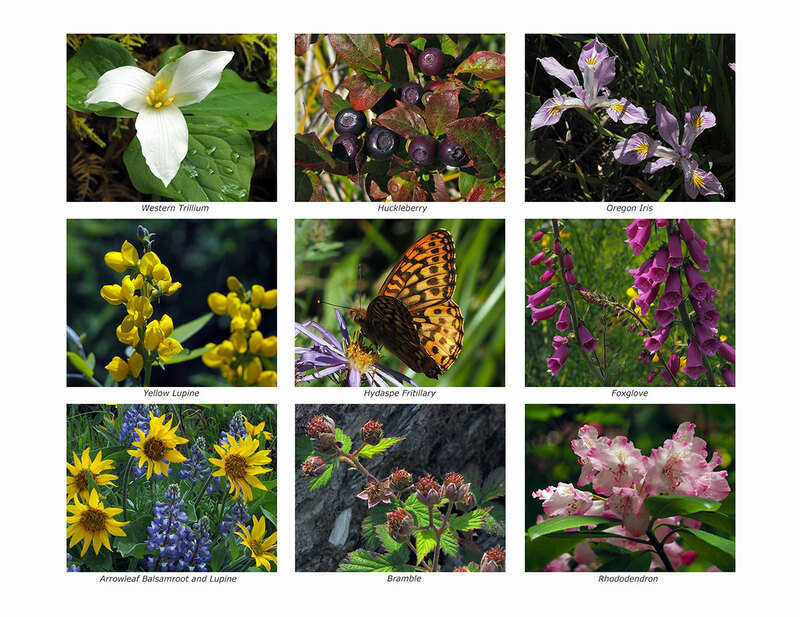 More importantly, they ensure that I continue to explore new places in the gorge and on the mountain, as each calendar consists exclusively of photos I’ve taken in the previous year. 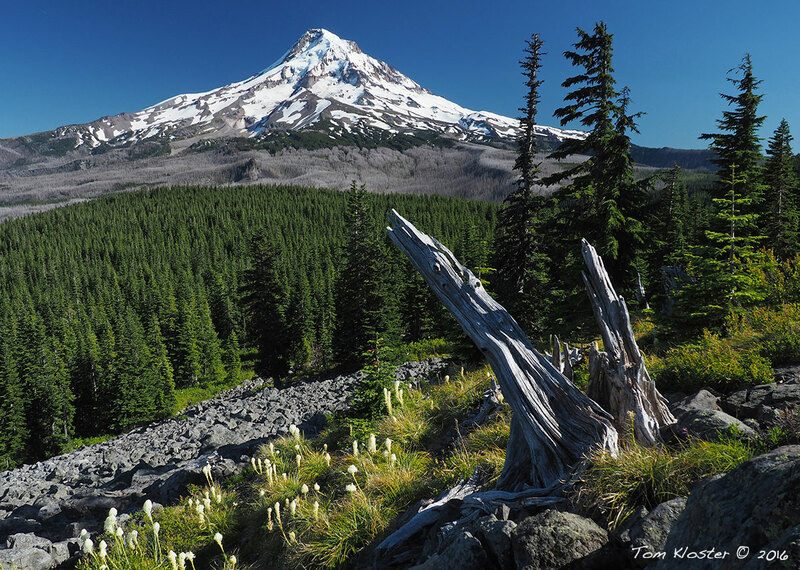 In this article, I’ll provide some of the stories behind the photos in the new Mount Hood National Park Campaign Calendar. Beginning in 2016, I’ve published the calendar at Zazzle, where the quality of printing and binding is much better than my former printer. The excellent print quality shows in the front cover (above), a view of the northwest face of Mount Hood from Cathedral Ridge where the color accuracy does justice to the vibrant cliffs on this side of the mountain. The finished calendar hangs 14 inches wide by 22 inches tall, with a white wire binding. The following is a rundown of the 12 images inside the calendar by month, with a link to a large version of each image, too. This year, I’ve posted especially large versions to allow for a closer look at these scenes (in a new window), and you can see them by clicking the link beneath each preview image. This popularity of this trail in winter has ballooned in recent years, from almost no visitors just a decade ago to traffic jams on winter weekends today. The scenery explains the popularity. While the trail is lovely in the snow-free seasons, it’s downright magical after the first heavy snows in winter. The scene below is typical of the many breathtaking vistas along the hike during the snow season. It’s still possible to have the place to yourself, however. Go on a weekday, and you’re likely to find just a few hikers and snowshoers on the trail. Thus far, no Snow Park pass is required here – though that will surely come if the weekend crowds continue! This view is unique to the extent that it was taken from the Old Vista Ridge trail to Owl Point – a route that was reopened in 2007 by volunteers and provides a perspective of the mountain rarely seen by most visitors. 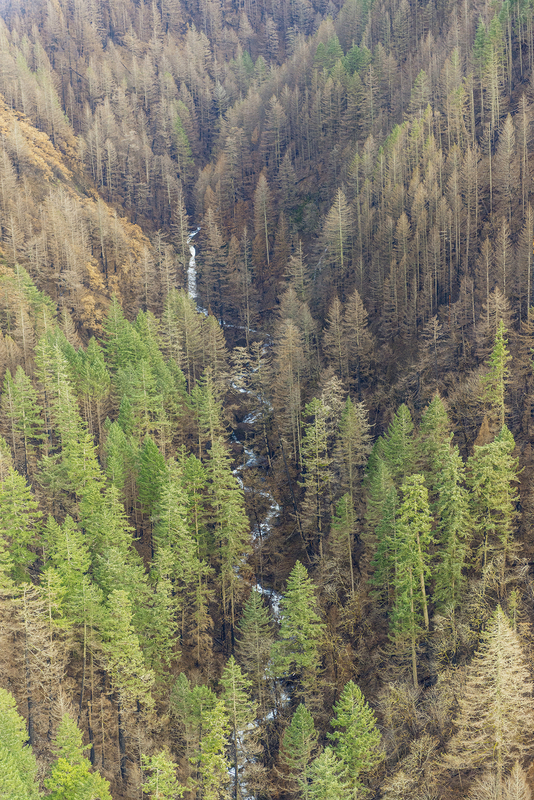 This is on the margins of Mount Hood country, but deserves better protections than the Oregon Department of Forestry (ODF) can ever provide, given their constitutional obligation to log state forests to provide state revenue. 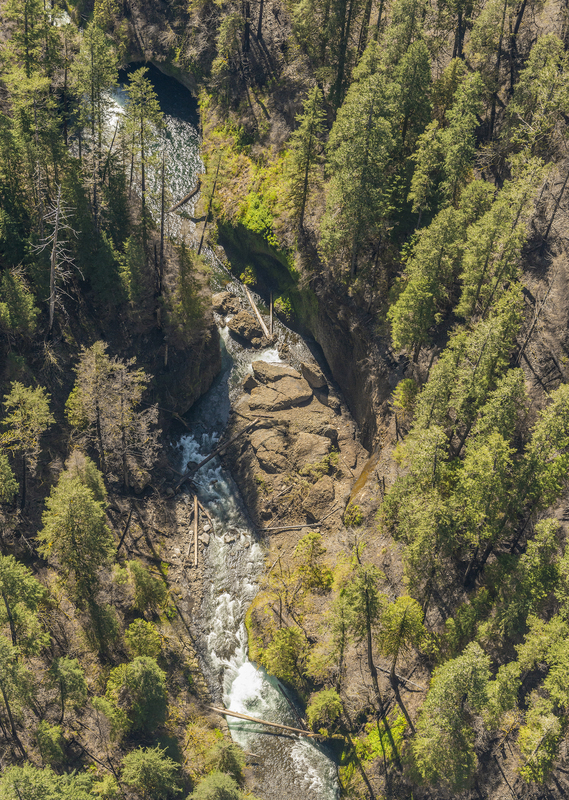 While ODF has done a very good job with the short trails that reach the waterfalls of Butte Creek, the bulk of the watershed is still heavily managed for timber harvests. 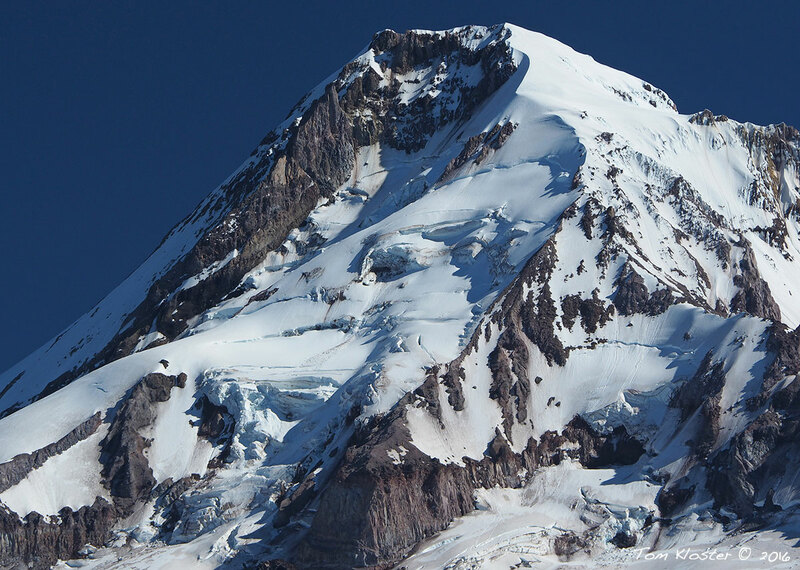 Who knows, someday maybe it will be part of a Mount Hood National Park? It’s certainly worthy. Not much damage to the car, and the note more than made up for it! I did contact Jesse, and ended up speaking to his dad. I thanked him for being an excellent parent. With dads (and moms) like this, our future is in good hands! Just me and a few hundred other photographers up there to enjoy the wildflowers on that busy, sunny Sunday afternoon! 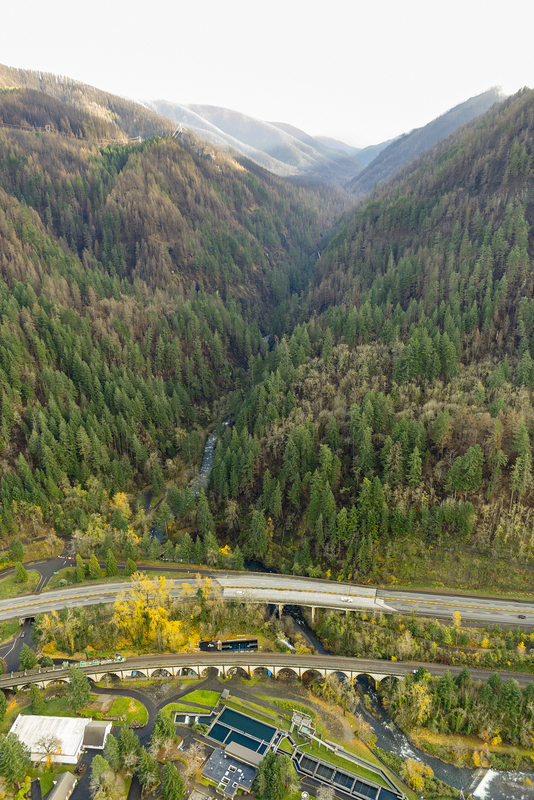 Look closely, and you can see a freight train heading west on the Union Pacific tracks in the distance, lending scale to the enormity of the Gorge. 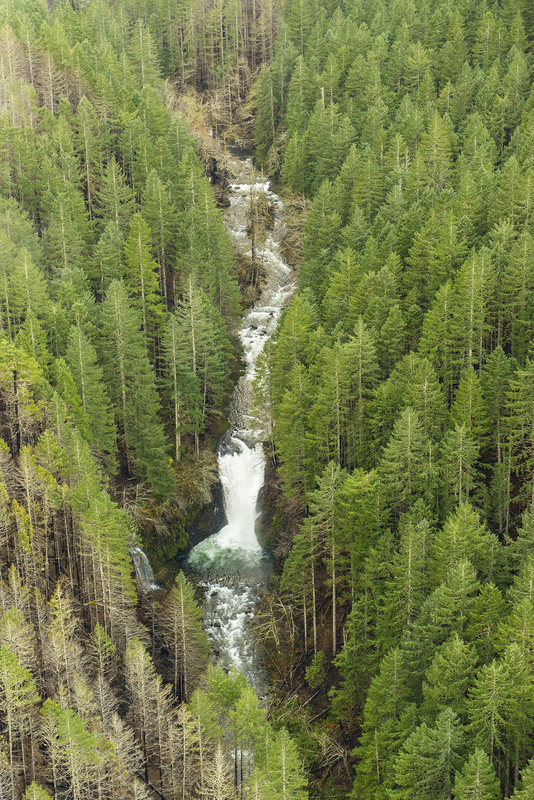 The spring rains faded quickly this year, resulting in much lower flows along Eagle Creek by the time spring greenery was emerging, making it less chilly to wade out to the view of the falls. To the right of the falls you can also see the latest downfall to land in front of the falls. To my eye, this adds to the scene, so I see it as a plus. This pattern will continue as it has for millennia, as other large Douglas fir trees are leaning badly along the rim of the Punch Bowl. They eventually will drop into the bowl, too, frustrating future generations of photographers! Look closely and you can see flapper-era hikers on the rim of the bowl and several rock stacks left by visitors on the gravel bar – some things never change! 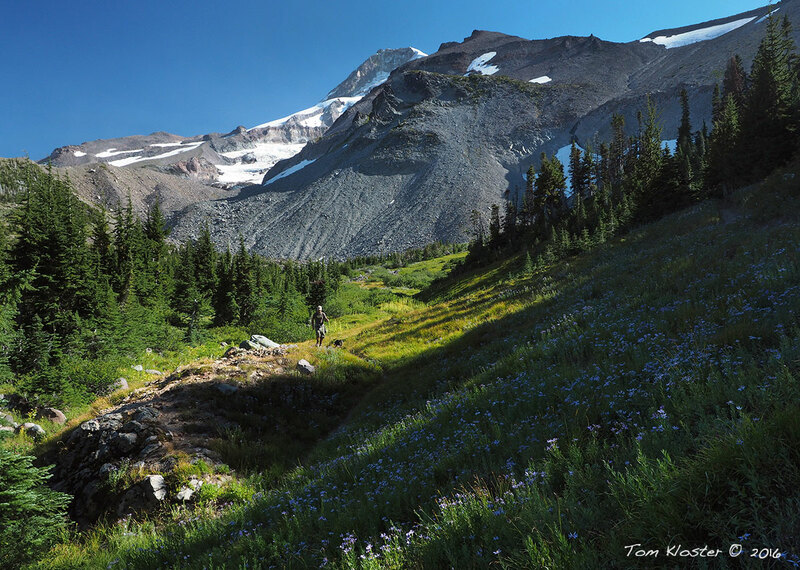 For the purpose of keeping track of unnamed places, I’ve called the talus-covered butte in the photo “Pika Butte”, in honor of its numerous Pika residents. 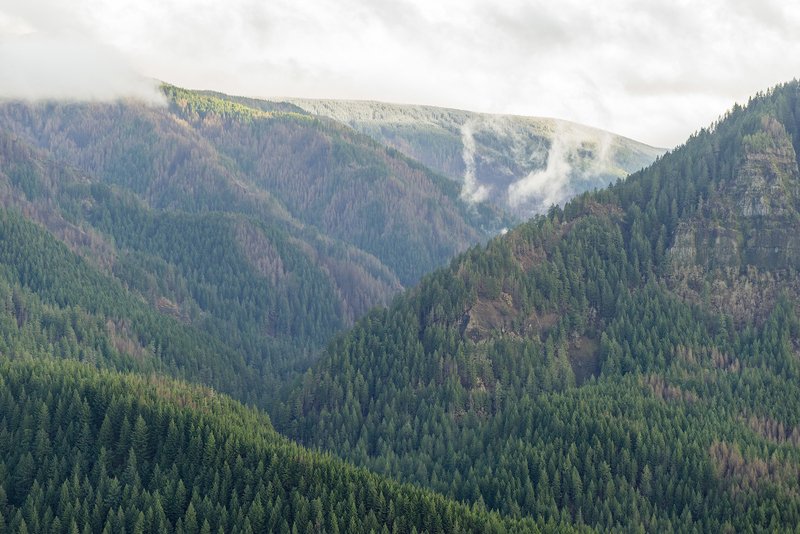 The peak from which the photo is taken is an extension of Blowdown Ridge, a much-abused, heavily logged and mostly forgotten beauty spot that deserves to be restored and placed under the care of the National Park Service. If only these stones could tell us the story behind the mystery! Nobody really knows why ancient people in the region made these pits, but it’s always a powerful experience to find them, and imagine the lives of indigenous peoples unfolding in the shadow of Mount Hood. These pits had a clear view of the Hood River Valley, with the Columbia River and Mount Adams in the distance. Indian pits often feature a sweeping mountain or river view, adding to the theory that they were built with a spiritual purpose. 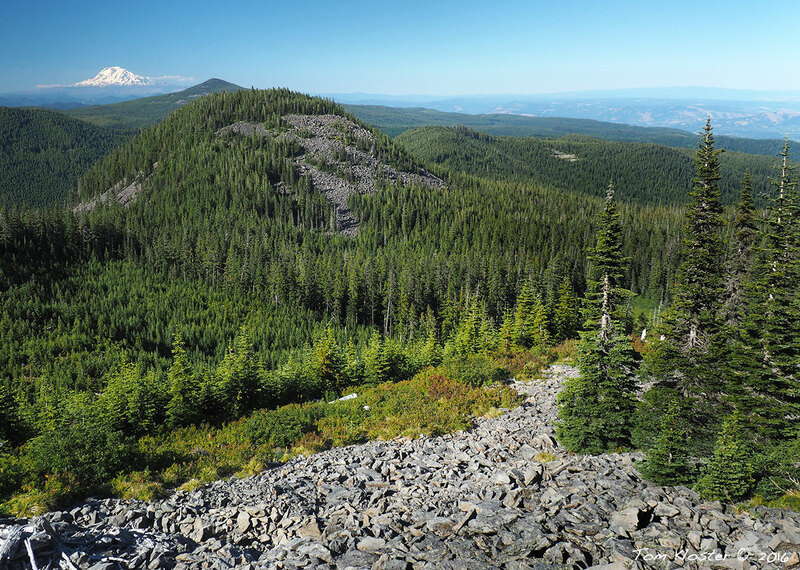 In a few months I’ll share some exciting news about the Old Vista Ridge Trail, Owl Point and the surrounding areas on Mount Hood’s north slope. Stay tuned! The hiker (and his dog) approaching me in this photo stopped to chat, and I was surprised to learn that he was a regular reader of this blog! The location of the shelter was a surprise to me, as I had long thought the building was located near a prominent clearing and campsite near the middle of Elk Cove. Now that I know the exact location, I plan to reproduce the 1960s image on my next trip to the cove, for comparison. This area has a fascinating history, as today’s Wyeth Campground is located on the grounds of Civilian Public Service Camp No. 1, a World War II work camp for conscientious objectors. 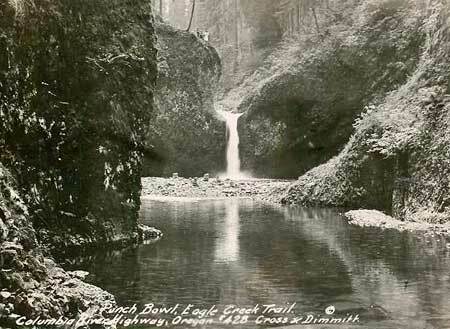 The men serving at this camp built roads and trails throughout the Gorge, in addition to many other public works projects. The camp operated from 1941-1946. 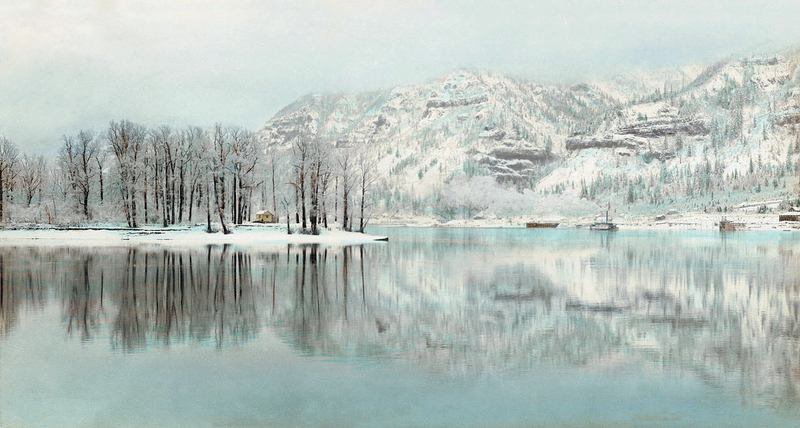 You can learn more about the Wyeth work camp here. 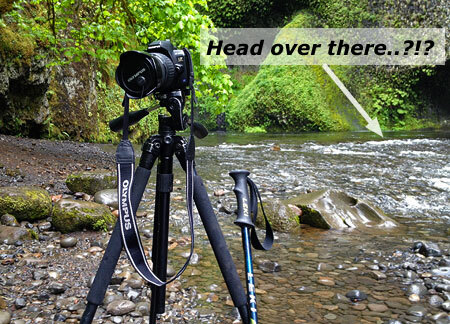 A bugs-eye view of Multnomah Falls? To young photographers of the digital age, blending photos is routine. But for those of us who started out in the age of film photography and darkrooms, the ability to blend and stack images is nothing short of magical – and fun! While younger photographers are increasingly exploring film photography as a retro art, the digital age is infinitely more enjoyable than the days of dark rooms, chemicals and expensive film and print paper for this photographer. 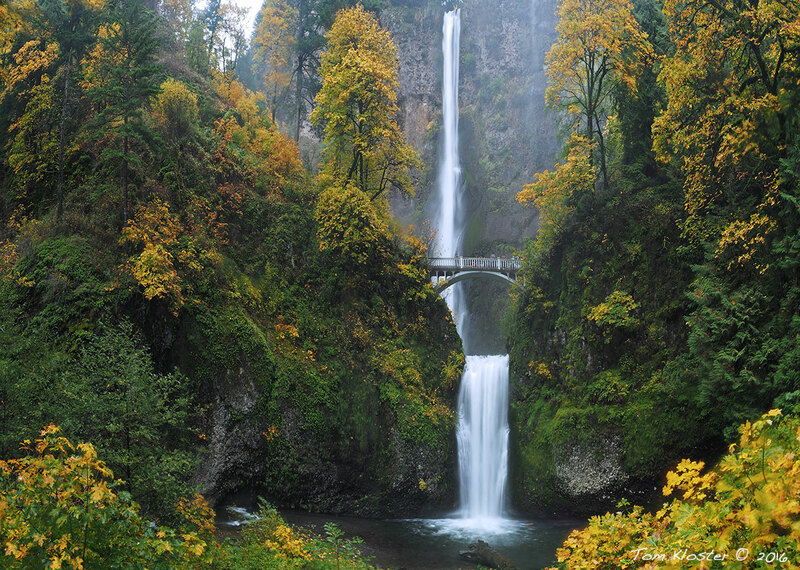 I paused before including a winter-season photo of Wahclella Falls for the November calendar image (below). Why? Because I’ve used a photo from this area in nearly every calendar since I started assembling these more than a decade ago. 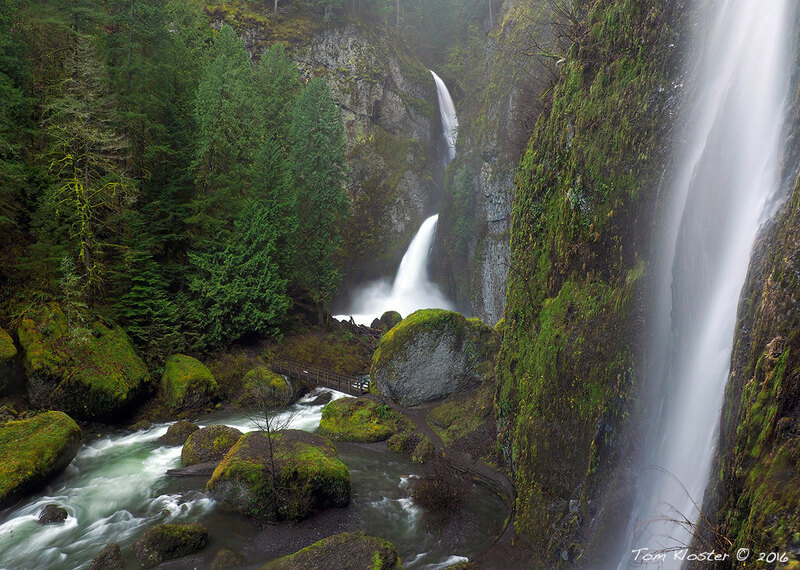 It’s my favorite Gorge hike – I visited Tanner Creek and Wahclella Falls five times in 2016 – and have photographed this magnificent scene dozens of times, and yet it never gets old. 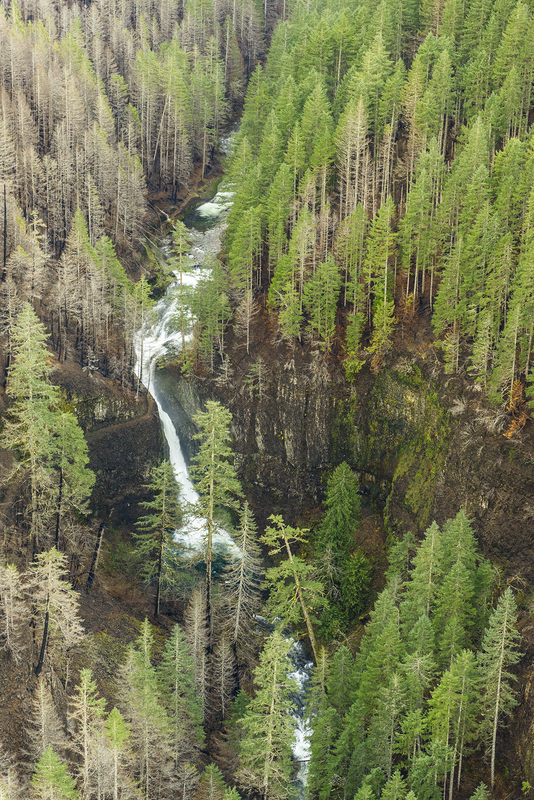 Wahclella Falls is a winter spectacle! 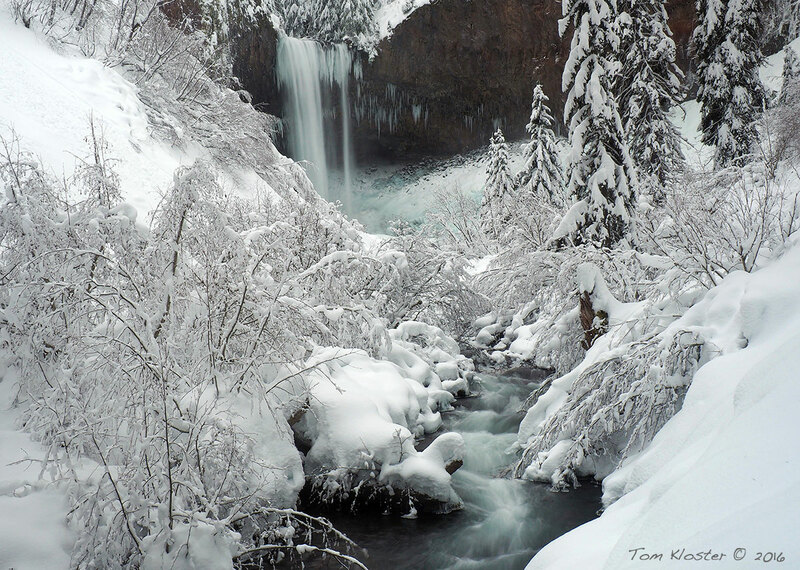 I decided to include this Wahclella Falls scene because it captured a particularly wild day on Tanner Creek last winter. The stream was running high, filling the canyon with mist and seasonal waterfalls drifted down the walls of the gorge on all sides. 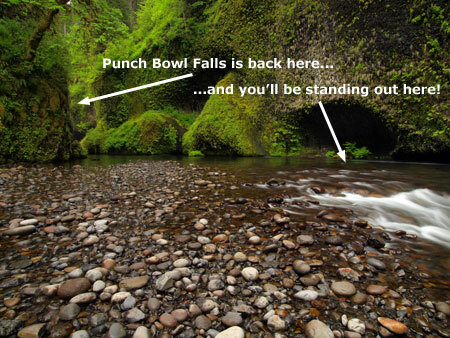 So, another calendar featuring Wahclella Falls? Yes, and it certainly won’t be the last. 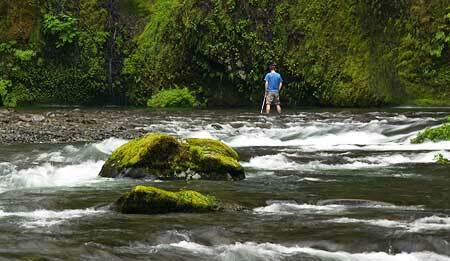 This is among the most magical places in the Gorge – or anywhere! 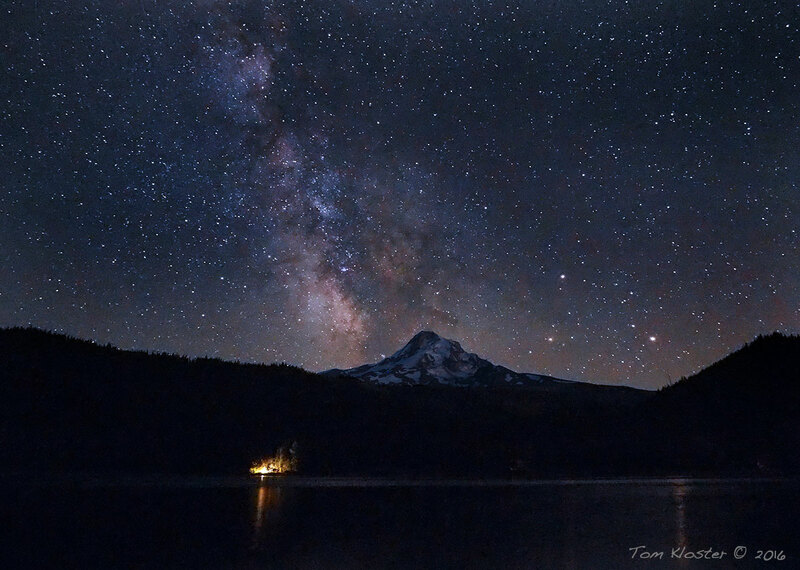 My tour guide and instructor that evening was Hood River Photographer Brian Chambers, who I profiled in this WyEast Blog article in June. Thanks for a great trip, Brian! 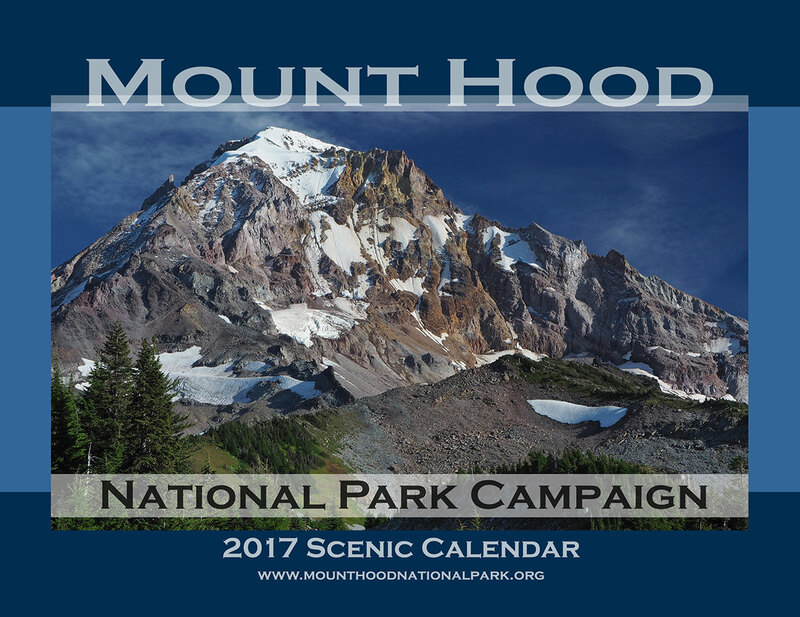 So, if you’re looking to support the blog and Mount Hood National Park campaign or just have an ugly fridge to cover, you can order the new calendar on Zazzle. Post-election deju vu: back to the future..? 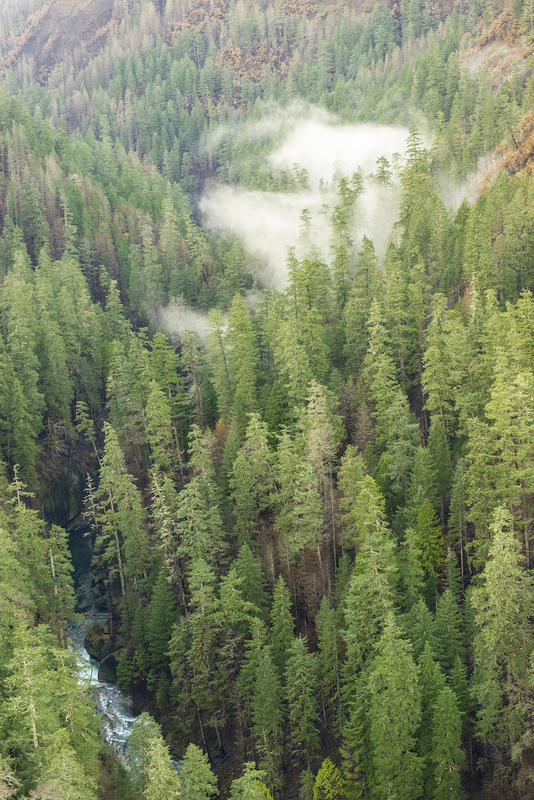 Viewed through the lens of protecting public lands and the environment, the presidential election results on November 8 are discouraging, at best. For those of us who have voted in a few elections, it feels a lot like the Reagan Revolution of 1980. So, the following is a bit of speculation on what lies ahead based upon what we’ve been through before, but with the caveat that unlike that earlier populist surge against government, the environmental agenda of the coming Trump administration is somewhat less clear and appears less ideologically driven. Ronald Reagan’s vision for government brought a very specific mission to dismantle environmental regulations and open up public lands to commercial interests. To carry out the mission, President Reagan appointed the highly controversial James Watt to head the Department of Interior, and the nearly as controversial Anne Gorsuch to run the EPA. 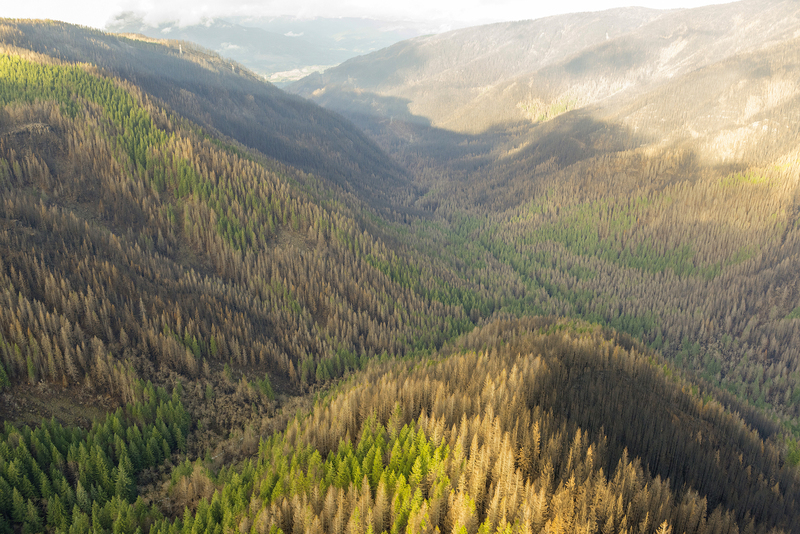 John Block was tapped to head of the Department of Agriculture (which oversees the U.S. Forest Service). Watt and Gorsuch were attorneys, Block a farmer who had entered politics as an agriculture administrator in the State of Illinois. Watt and Gorsuch became infamous for their open disdain for conservationists and the agencies they were appointed to administer. Watt was the Reagan administration’s sympathetic gesture to the original Sagebrush Rebellion. Block focused primarily on an ideological rollback of farm subsidies and programs that dated to the Dust Bowl, and that would eventually be his downfall. The important lesson is that all three rode in with a “revolution” mandate, and over-reached in their zeal to rewrite American policy overnight. The blowback was instant, and though they did harm our conservation legacy during their embattled tenures, they didn’t have the lasting impact many had feared. Both Watt and Gorsuch were forced to resign before the end of President Reagan’s first term, and Block resigned in the first year of Reagan’s second term. Even Readers Digest covered the EPA Superfund scandal that drove Anne Gorsuch out of office! Gorsuch was eventually pushed out by Reagan for attempting to conceal EPA Superfund files from Congress as part of an unfolding scandal, becoming the first agency head to be cited for contempt of Congress. Before the scandal drove her from office, Gorsuch became Anne Gorsuch Burford when she married James Burford, Reagan’s Bureau of Land Management (BLM) chief, further fueling concern about whether environmental protections could be objectively enforced on BLM lands. John Block lasted five years, but was pushed out in early 1986 as the worst farm crisis since the Great Depression unfolded under his tenure. Watt left in more spectacular fashion after stating (apparently a joke) that an ideally balanced advisory panel would include ”a black, a woman, two Jews and a cripple.” (and in the age of Google, he has been deservedly forgotten, with the more consequential James Watt – inventor of the steam engine – reclaiming his name in history). Will history repeat itself? We’ll see, but there is no reason to assume that the conservation community – and, importantly, the American public – will be any less motivated to speak out if the Trump administration attempts a similar rollback on public land and environmental protections to what the Reagan Administration attempted. Yes, there will be lost ground, but there will also be unexpected gains. That’s our system. Recall that the same President Reagan who brought James Watt to the national stage also signed the Columbia River Gorge Scenic Area Act into law thirty years ago, on November 17, 1986 (famously “holding his nose”, in his words). 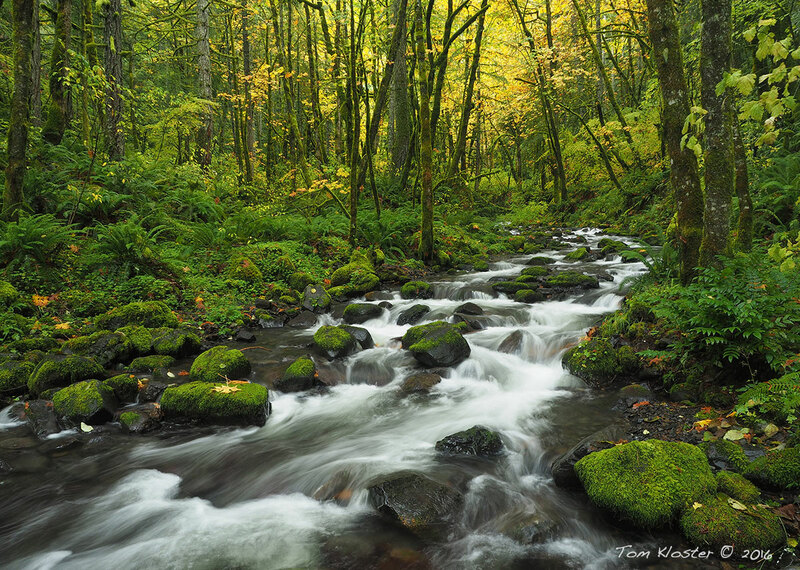 In his first term, President Reagan signed the Oregon Wilderness Act into law on June 26, 1984, creating 22 new wilderness areas covering more than 800,000 acres. As President Obama said in his reflection on the election, “democracy is messy”. He also reminded the president-elect that our system of governance is more cruise ship than canoe, and that turning it around is a slow and difficult process, no matter what “mandate” you might claim. That is by design, of course. …and the WyEast Blog in 2017..? 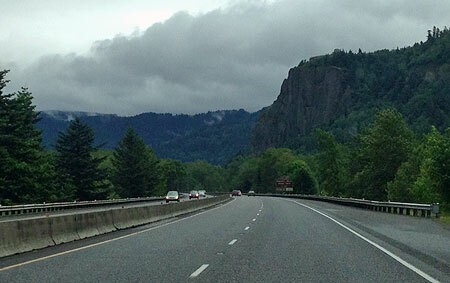 Looking ahead toward 2017, I hope to keep up my current pace of WyEast Blog articles as I also continue my efforts as board president for Trailkeepers of Oregon, among other pursuits. And spend time on the trail, of course! As always, thanks for reading the blog, and especially for the kind and thoughtful comments many of you have posted over the years. The blog is more magazine than forum, but I do enjoy hearing different perspectives and reactions to the articles. Despite the election shocker this year, I’ve never felt better about Mount Hood and the Gorge someday getting the recognition (and Park Service stewardship) they deserve! That’s because of a passionate new generation of conservations are becoming more involved in the direction of our nation and our public land legacy. The 2016 election seems to have accelerated the passion this new generation of stewards brings to the fight. Our future is in very good hands, indeed. See you on the trail in 2017! Comments: Comments Off on 2017 Campaign Calendar!